Today’s guest post is from Robert Lobitz who represents LED Lights Warehouse. Whether you are motoring across the country or just driving a few hours down the road, it is important to have a survival kit in the car with you. There are a few basic items to include, especially the following essentials. Medical kit. The first thing that you need is a well-stocked first-aid kit. The basic med kits available at all-purpose stores do not have sufficient care items for an emergency. It is better to special order a survival kit with a hard-bodied case—one with enough space to add your own necessary or preferred items. If possible, get a case that is watertight to help protect the contents from water damage that will make them unusable. For example, sterile bandages become useless if the packaging is damaged. Flashlight. You must have a reliable flashlight and an extra set of batteries in your car. The old style of flashlight is no longer adequate because chances are the batteries will be dead when you really need it. 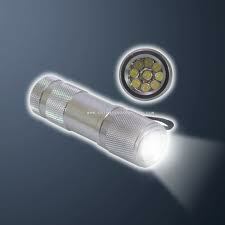 LED flashlights are the most durable and efficient flashlights on the market. Survival specialists even recommend LED flashlights powered by solar cells or a hand crank—no batteries needed. Flashlights are also handy for emergency repairs and checking under the hood when your car breaks down in the middle of nowhere. Emergency flares. You should also have LED emergency lights with you. If your car runs out of power, your hazard lights may not work—a dangerous situation at night when oncoming cars may not be able to see your stopped vehicle. Stand-alone emergency lights with internal batteries will help prevent additional accidents when you’re stranded. Gather these items, put them in your car, and keep them up to date. Periodically check the charge on batteries, expiration dates on medical supplies, and bulbs in your lights (when you change time on clocks is a good time to do this). A little effort now will keep you prepared in case of an emergency on the road. These are great tips. I also always pack some protein bars and bottled water. This could be important if I get stuck somewhere remote for any lenght of time.